We are open 7 days a week from 6:00 a.m. to 8:00 p.m. Satisfy your sweet tooth with delicious, homemade donuts from Dixie Cream Donuts & Metro Deli in West Frankfort. We offer the BEST donuts in Southern Illinois! Call us to place an order today or stop by, sit down, and enjoy our donuts made fresh daily. We have an outdoor patio opened seasonally, seating indoors, and free Wi-Fi. Come check out our delectable offerings! There is no better way to wash down a donut than with a steaming cup of coffee. Order yourself a mug, or try some of our other menu items, including sandwiches, salads, cakes, and ice cream. 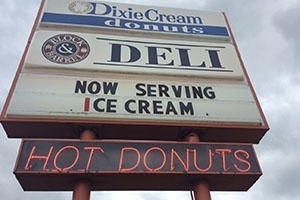 With more than 60 years of donut making, Dixie Cream is known not only for its donuts, but also for its fresh muffins, fried pies, cream horns, and those famous pink sugar cookies. Come in and enjoy these irresistible treats with a steaming cup of coffee. Perhaps your business can benefit from the addition of some of our delicious products? We offer wholesale programs. Call Steve Forgatch to discuss the option of stocking your shelves with our scrumptious donuts! Call Steve Forgatch to discuss the option of stocking your shelves with our scrumptious donuts! 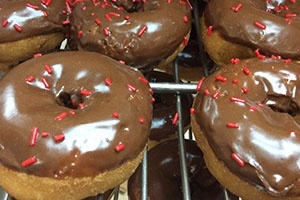 We have been in the donut business for more than 60 years, baking up fresh, homemade donuts every day. As a family-owned and operated company, we take pride in our products, serving only the best to all of our customers. Whether you enjoy glazed, cream-filled, chocolate or cake donuts, we have a large selection of flavors sure to appeal to anyone. Brighten your day with a warm, tender treat at any hour! We have expanded beyond just donuts! 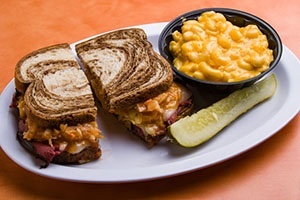 Our delicious deli offers sandwiches, salads, cake, and ice cream. In addition, we offer a wide range of thirst-quenching drinks to wash down any treat!